– SHACK THOUGHTS – The Shack Project celebrates MMW @25 years! My first 2 MMW live shows. Life changed forever. I’d been listening to the band for a few years by this point, had maybe 15-20 cassettes of live gigs and was digging it and knew I had to see them live. The shows I had were all from ’95-’96, nothing from ’97, so when I went to these April ’98 gigs it was like encountering a *completely* different band. What? A DJ? Huh? What are these songs? Lots of new music … unknown sounds … and I was hooked! I can recall a small Canadian contingent that all came from my home area (Saint John, NB), and we were all gathered centre on the floor, against the railing that divided this middle section of the floor from the step-lower front section of the floor. None of us had seen MMW live, but we’d all heard them either peripherally or with some degree of focus (that would be me and one of my buddies). The tech guys (Kenny?) are flittering around the stage, and some guy comes out and grabs the stand-up bass and starts plunking away — I’m thinking he’s soundchecking the thing, but it sounds cool (I’ve been fooled by tinkering soundchecks before in altered states of consciousness though, so I wasn’t buying this one … yet). Then the dude starts whacking the main body of the bass — I’m like, what’s he doing?! Then back into the groove. Then 2 other guys come out from each side, one sits at the keys, the other at the drum kit, and we move from an opening Bass Solo > Basso Profondo, and we’re off! At this time I’d never seen a picture of the band — well, maybe one in the back of Relix, in the up-and-coming section or something, but I really had no idea what the band looked like so when Chris came out, and the lights didn’t change, we didn’t realize the show had even quite begun until we were already swept away into it. Nice. 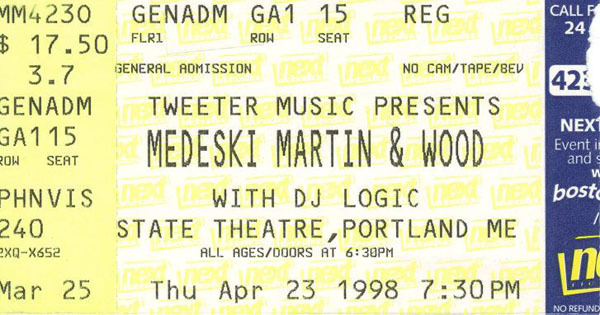 No idea how special that was at the time, but it grabbed me right into what MMW were doing onstage — I was hooked. I’m not sure I can even think of *any* other gig that opens with a bass solo, and Basso Profondo, it turned out, was a new tune to the band’s repertoire — I think it’s their own tune? — but was never really played much. A handful of times ever, so nice to have caught a performance — and especially nice that performance was captured by a kind-hearted taper who shared his efforts. Thanks, Brian! … and check out Roland Kirk more if you haven’t — the guy can lock a groove! Once again, I recognize very little in this set which is both exciting and, well, at that time I liked having more of a handle on what I was going to see live so it was a little confusing too — while the 1st set was mostly new music, it was the trio and I was loving it. The 2nd set with DJ Logic would prove to just confuse me on top of all the new music as I had a hard time picking out Logic’s sounds at various times, while other times it was obvious. I’m not a fan of DJs, I just don’t really get it, but I can appreciate something about it — and I trust MMW wholeheartedly, so if they wanted to get down with a DJ, then I was game to hear it. The opening improvisation set the spacey tone for what the keys and Logic could do together — hmmm, this could be interesting — which slams into Sugar Craft and showcases Logic as a percussive DJ perfectly. He has real purpose in that tune, which would become a tune they would play with him just about any time he would return to sit in over the next decade and beyond. After the Open Improv, with some degree of groove about halfway in, moving > Sugar Craft, which showed us what the new w/DJ sound was like, the band explores some more open space coloured by Mr. Logic, and then we drift into a VERY welcoming groove with Is There Anybody Here That Love My Jesus. ITAHTLMJ is probably the earliest MMW melody I remember, specifically solidified in my memory from the moment my buddy threw on this new MMW disc his brother had purchased – his older brother was *always* buying new music, so we had access to lots of sounds as a result. We’d heard MMW before that, but that’s the moment where they really *clicked* for me, I guess, since it stands out so much. That swirling keyboard that starts the studio version on the Shack-man album had me hooked – never heard anything like it before! For this performance, it’s the bassline that gets us going while John and Logic sprinkle some sounds until John brings in that key sound as just a long sustained note, then the groove is in and we’re boppin’ our heads – and dancing! That’s what I remember at these first shows is dancing! Next up was a brand new song to me and it’s a great boogie. Coconut Boogaloo brightens up the set at this point – it’s a nice cheery groove – but that busts apart as the tune comes to an end and then, what at the time I’m sure was just chaotic madness, out comes COMBUSTICATION itself! The namesake tune, buried on the album as a hidden track that surfaces minutes after the closing track, Hypnotized, wraps up, and this crazy groove REALLY rocks you to the core. It’s hilariously HEAVY! What follows is about my favourite sequence of the gig. After Billy introduces everyone, a little groove starts building, mostly Logic and illyB at first, but then John and Chris jump in and after 1.5min or so a groove begins that has eluded me for lo these 18 years: This looks to be the very first known performance of what would become Toy Dancing only 2 shows later – they mess around with it loosely again the next night in Boston, but by Philly’s performance on 4/25 it’s pretty much Toy Dancing as we know it – well, the song, just like the rest of them, goes through mutations and variations of sorts, but at this time it is in its infancy and VERY cool to hear. Then suddenly the pace is picking up as the groove morphs and we are in a full-on BUBBLEHOUSE! Nice, another tune I recognized! There’s a reason everyone calls out for this song, and it’s not just because it’s one of the only titles folks know (even if they don’t know what song it might apply to), but it’s because this is one FREAKIN’ KILLER groove! John moves to the piano for part of this performance and things spin into a jazzy area, but still just pumping – illyB is locked in tight. 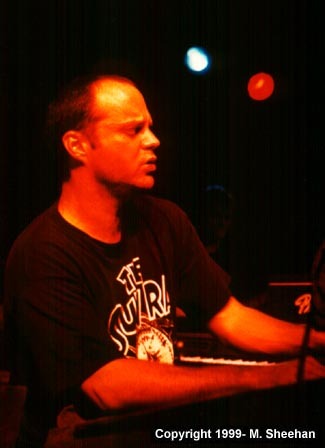 The band keeps driving it until the end builds tension between Medeski and Logic, and boom, we’re done. Billy intros the band again, Logic swirls some sounds, and it’s goodnight. The band comes out for a classic encore of Chubb Sub, another welcome and familiar tune to my ears. Billy apologies that they’ve run out of time, and only have until 11pm, but that they’re gonna play it out – great news, but I was honestly a little miffed because the band came on *almost* an hour late – huh? Never heard why or anything, and I was totally satisfied with the breadth and depth of music played, and hopefully the late start was beyond their control … I just pictured them drinking wine backstage or something … HA! Anyway, an incredible introduction to the live MMW experience – and I was so stoked to head to Boston the next day for more grooves!